The bus fell into the river after a collision with an oncoming car. Not all superheroes wear capes, they say. Some, like this quick-thinking crane driver in China, simply react to a tough situation and help make a difference. 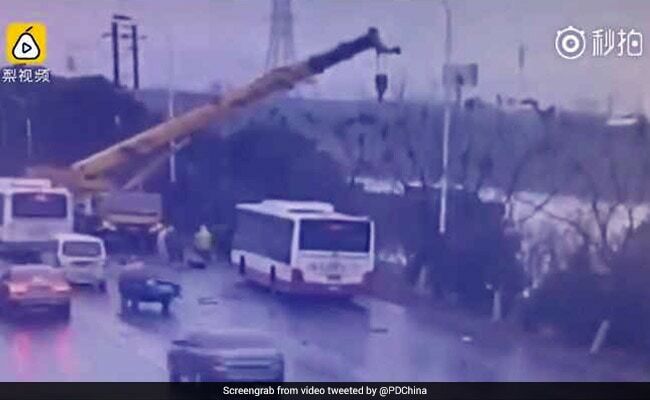 A video circulating on social media shows a crane driver rescuing passengers from a bus that fell into a river after an accident. The video, posted by People's Daily, China shows a speeding car colliding into a bus. The impact not only causes the car to wreak and sway on the road but also causes the bus to fall into a nearby river. That's when the crane driver gets into rescue-mode. He is first seen climbing down the crane and running across the road to ascertain the situation. He then runs back to the crane, driving it over to the other side of the road. Once there, the driver uses the crane to pull out the passengers of the bus. The incident took place in Changzhou, China's Jiangsu Province on January 3. According to South China Morning Post, by the time firefighters arrived on the scene, all the passengers - and the bus driver - were out of harm's way. The car that collided with the bus also overturned but its driver reportedly escaped the incident unhurt. Since being posted on January 7, the video has collected over 36,600 views, some 1,000 'likes' and more than 300 retweets. "So very glad to see strangers helping humanely in moments of need. Kudos," says one Twitter user. "Well-done.The crane driver is a true hero," says another.